Last Chance – Gizmodo readers can get 45% off the Micro Drone 2.0. With it's attached camera, the R/C Micr0 Drone captures footage while literally doing 360-degree flips in the sky. For $69.99 (half-off) this is a good deal on a fun gadget. 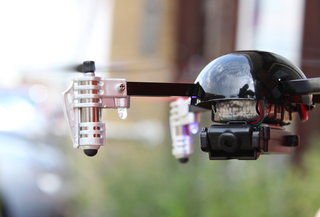 TechCrunch gadgets loved it, saying the Micro Drone 2.0 had a "surprisingly powerful brain." Just watch the video, this thing is sweet. This Micro Drone isn't the most powerful drone available, but it's a solid starter drone for 50% off. It's the only Micro Drone in the world that carries a camera with a swiveling lens to capture all angles.